Before we dive into this post, let’s get something out of the way: My kids have too many toys. I know it, you know it, we all know it, and they won’t believe it for a second. Thinning out the hoards we’ve collected over the years is going to be a post all on its own. For now, today’s topic is about how to equip kids to manage their stuff when there is a mountain of it. Because as a result, you’ll equip them to manage the mountains they’ll face in life. I finally realized that their attitudes weren’t the root problem. I’m grateful to say that my kids generally have obedient spirits and are joyful. The way they were acting about this job was out of character for them. The truth of the matter is, I was giving them a too-large job without teaching them how to execute it well. It dawned on me that this was an great opportunity to teach my kids an important life skill: How to break down a big, daunting job into smaller tasks that can be done one at a time until the whole project is complete. How many times have I been facing a project that is so huge I don’t even want to start? Or don’t know where to start? Or get distracted along the way? My kids playroom- because it’s way too big with way too many toys-- is a kid-sized picture of the adult sized mountains they’re going to have to learn how to climb in life. When we have to do a huge thing we don’t want to do, or don’t know how to do, the best way to get it done is to break it up into manageable pieces, right? So that’s exactly what I needed to teach my kids how to do in their playroom. They need to learn that you climb a mountain by putting one foot in front of the other. 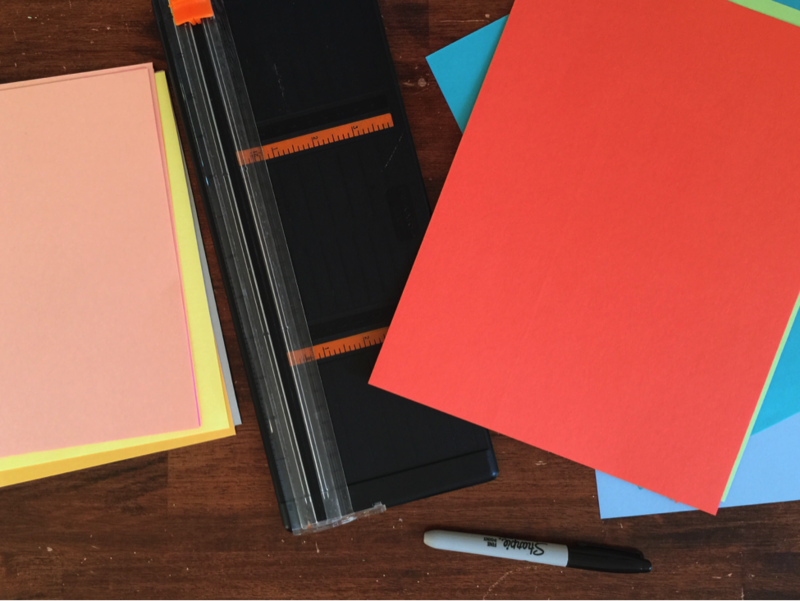 I sat down with the kids and a stack of brightly colored card stock and a sharpie, and we listed out all the small, one-minute tasks that, when completed, would result in a clean playroom. We cut the sheets of 8-½” x 11” card stock in half, and wrote one task on each piece of the card stock. After it was all done, we had 46 chore cards. The last card says “Mom’s Choice (Save for Last)” because I knew there would be something we’d forget or an odd piece of clothing left over after every cleaning session. We then laminated the cards. You can have this done at an office supply store or buy your own laminator. 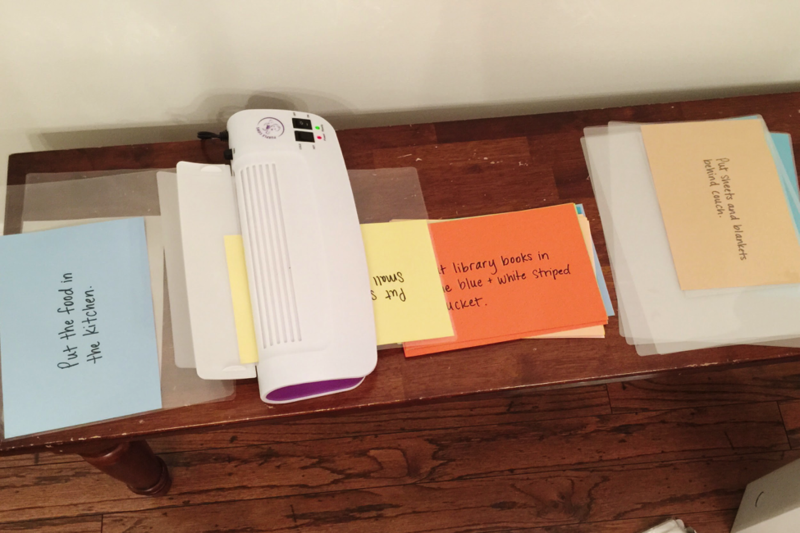 The laminating machines can be purchased for around $20 at Target or Costco and I use mine all the time. At Office Depot, I bought two clear wall mount file holders and hung them vertically on the wall. I labeled the top one “Dirty” and the bottom one “Clean.” They are hung totally in reach of the young ones (I tested the height on my three year old before hanging). 3. Put the card in the bottom folder when it’s complete. When all the cards are down below, the playroom is clean! The test drive is always the most important part. Any system can work in theory, but I was curious to know if my kids would really clean the playroom successfully (and with good attitudes) using this method. Perhaps the novelty hasn’t yet worn off, but I am amazed at the difference in them! They just plugged through the cards, one at a time, until the room was done. With three kids, ages 9, 6, and 3, the room took 10 minutes. Even my little guy, (who initially protested because he heard the words “Clean the Playroom” and has learned by the example of his older siblings that these words must mean a fate worse than death), started to enjoy the sense of accomplishment and grown-up feeling of contribution as he completed cards. One example of a task is “Stack the Cardboard blocks in the Corner.” That is a lot more fun to a three-year-old than “Clean the Playroom.” Other cards feel more like a treasure hunt: “Put all the airplanes in a blue bucket.” It helps the younger ones be involved in as enjoyable a way as possible. Another great bonus of this system is that even young play-date friends can help clean up, if their moms ask them to, when they come over. It’s really hard for moms to instruct their kids how to clean up someone else’s house after they’ve been playing, especially as kids are starting to melt down toward the end of the date and moms have shoes to find, diaper bags to haul to the car, and a cranky baby that needs to nap. Most moms truly don’t want to leave a mess but also don’t even know where to start in the disaster. This is a quick way that they can train their own kids in being a helpful guest, without having to do it themselves or supervise closely. Kids can simply work on a card or two as their moms are packing up. One last personal note—my oldest son, who is 9, has a diagnosis of ADHD, and has a hard time organizing. This system is especially helpful to him. At his age, he shouldn’t have been the loudest protestor in our house against cleaning the playroom, but he wasn’t able to break down a job so big on his own. The long length of the task led him to easy distraction and frustration. I’d often find him playing with the toys instead of cleaning them. The cards are helping him to work on the playroom with a hugely changed attitude and he stays on task because the tasks are so rapidly accomplished. I wanted to share that in case anyone else has a child with the same tendencies and will find this helpful! Posted on August 19, 2015 by Laura Irion and filed under Building Your Home and tagged organization chores.